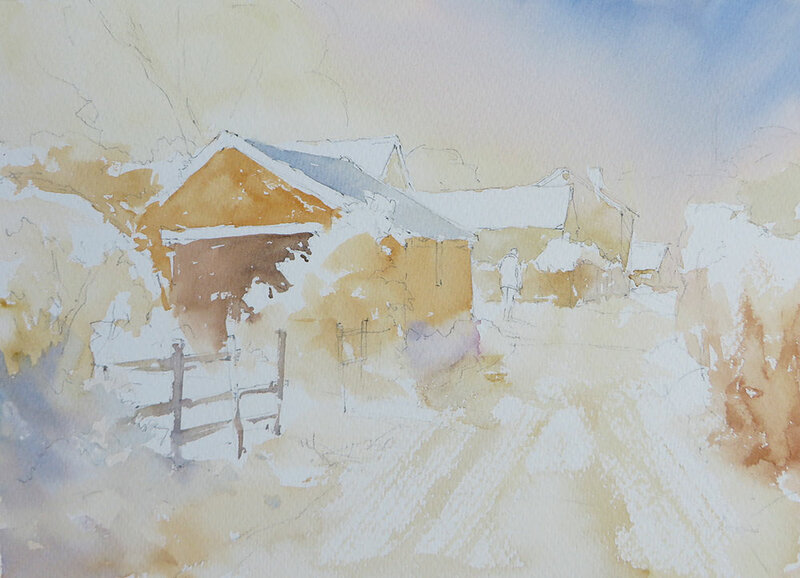 I’m always drawn to scenes with strong sunlight and shadows, especially during the winter months and this view of the old barn next to Chapel Cottage Studio near Abergavenny in South Wales makes an irresistible subject. 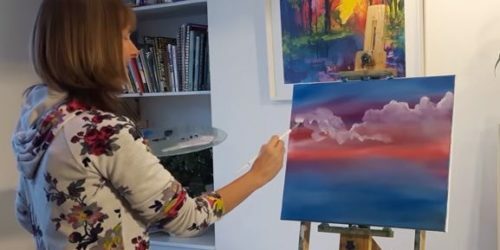 Raw Sienna, Burnt Sienna, French Ultramarine, Cobalt Blue, Alizarin Crimson and Permanent Rose. Get your free printable sketch here and use Transfer Paper to trace it on to your watercolour paper. 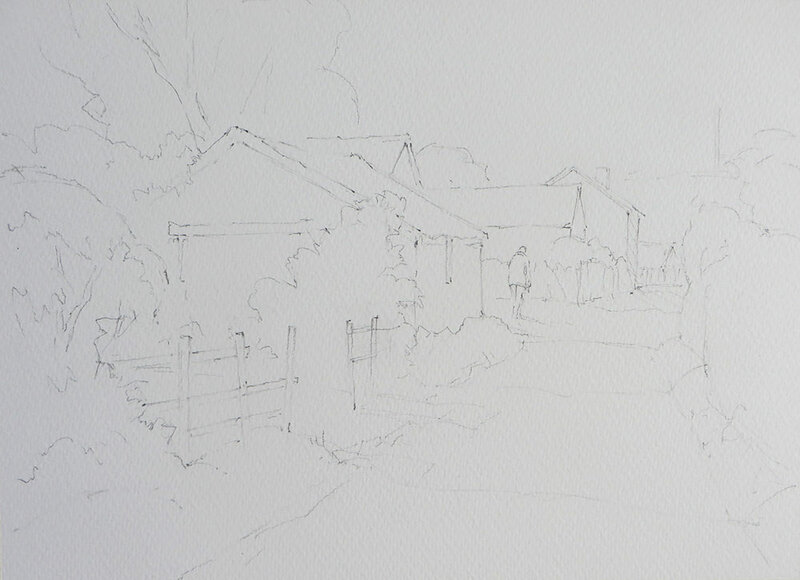 The main elements of the scene were lightly sketched onto the watercolour paper with a 2B Pencil. I noted how the bright orange brickwork of the barn stood out strongly against the dark winter trees so I made this my focal point, placing it on the left hand 3rd of the composition. Working background to foreground, I first wet the sky area and quickly dropped in Raw Sienna, Permanent Rose and Cobalt Blue to create a soft transition from warm to cool. The mid tones of the buildings were added with Raw Sienna and Burnt Sienna. A dilute mix of French Ultramarine, Alizarin Crimson and a little Burnt Sienna established the start of the shadows. 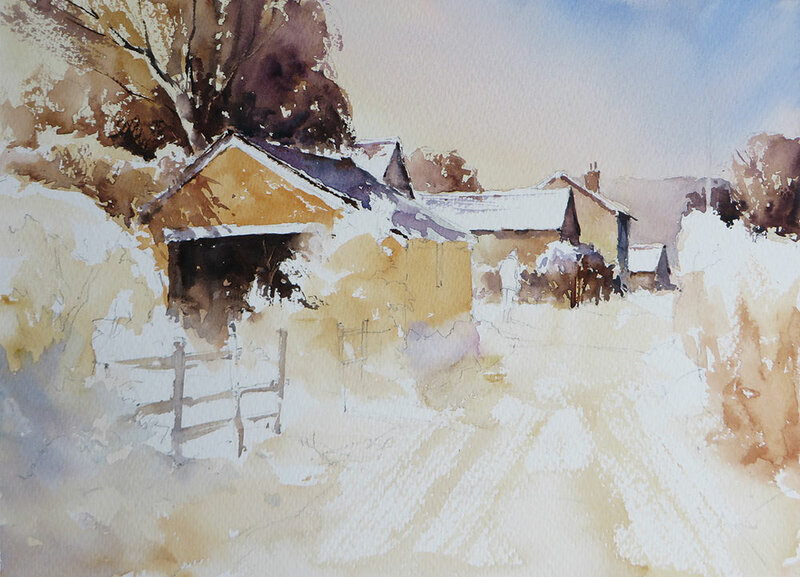 I then dragged a pale wash of Raw Sienna across the road to suggest the sunlit crisp snow. With the underpainting dry I used varying mixes of Burnt Sienna, French Ultramarine and Alizarin Crimson to develop the bushes, shadows on the distant buildings and the dark winter foliage behind the main barn. A strong mix of Burnt Sienna and French Ultramarine established the doorway and then Burnt Sienna alone for the shadows falling on the orange brickwork. Note how the dark tones create impact and define the snow covered roof tops. 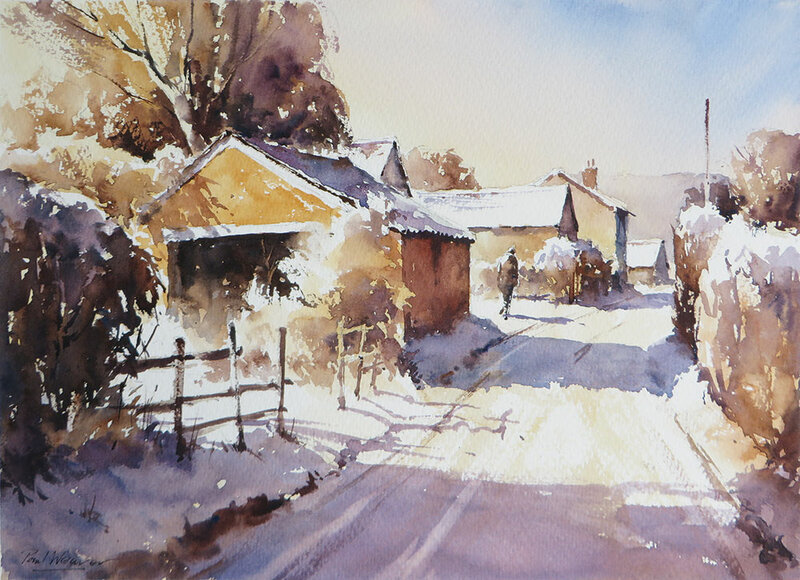 I next painted in the solitary figure and dark side of the orange barn in Browns and blues, quickly adding the shadows falling across the lane with a mix of French Ultramarine and Alizarin Crimson while these elements were still wet to create soft edges. The shadows are an important feature in conveying the direction of the strong sunlight, as well as the contours of the ground. Finally, the dark foreground bushes on the left, the fencing and their shadows were added. I refined the bushes around the doorway of the barn a little more to help define the sunlit fence. Burnt Sienna and French Ultramarine were used for the dark foliage and fence posts, while a dilute mix of the blue and Alizarin were used for the main shadows. Final touches were creating the track marks on the lane with dark brown and blue, while the lighter areas within the shadow were lifted out with a damp brush. 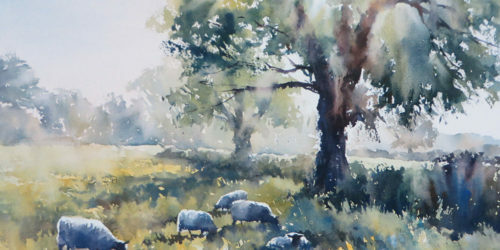 Paul Weaver is a full-time artist, tutor and demonstrator. His primary inspirations are light and atmospheric effects. Townscapes, markets and the bustle of the city are favourite subjects, as well as landscape, marine and coastal scenes. 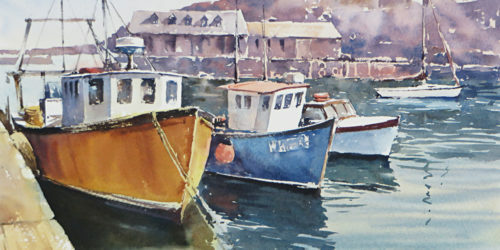 Paul currently specialises in watercolour, but also enjoys working in oil, acrylic and line and wash. 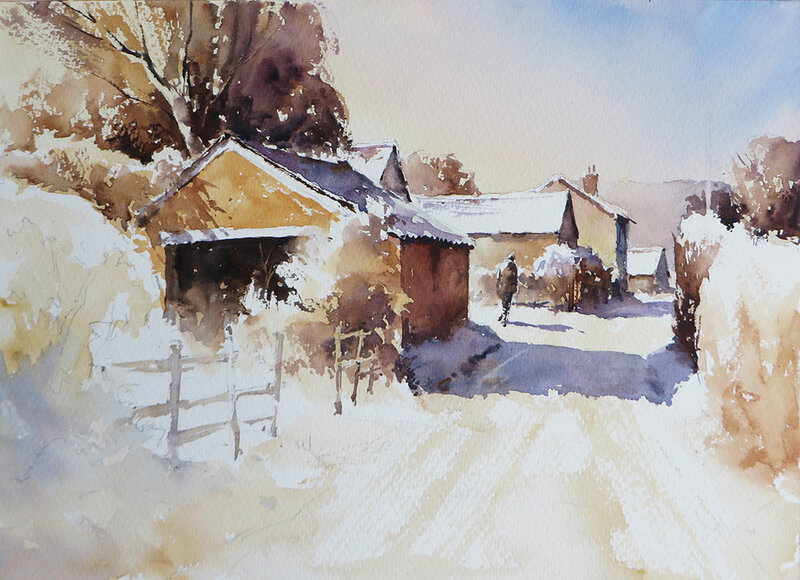 He is a demonstrator for St Cuthbert’s Mill and a regular contributor for ‘The Artist’ magazine. He is an elected member of the Pure Watercolour Society.